Job seekers can submit their Goldman Sachs application for a chance to work for one of the most successful companies in the investment banking sector in the entire world. Founded back in 1849, Goldman Sachs is now a Fortune 500 company and it currently employs over 37,000 worldwide. The vast majority of departments at Goldman Sachs abide by the standard corporate schedule. Candidates will be notified of any schedule modifications in the description of the position. According to the company’s hiring policy, all candidates for Golden Sachs employment must be at least 18 years of age to be deemed eligible. Please note that all the younger applicants will be automatically excluded from the hiring process. Young job seekers can apply for Golden Sachs internships for a chance to experience first-hand what it is like to work for one of the most influential companies in the investment banking sector. 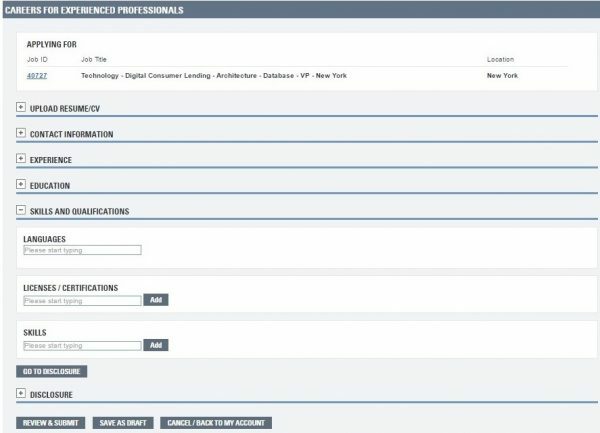 The Goldman Sachs application process begins with the company’s online careers portal. Job seekers will find complete information about the employment opportunities and the application procedure enforced by the company. Depending on their proficiency level, they can opt for Goldman Sachs careers for students and graduates or positions for experienced professionals. Young job seekers can even subscribe for employment events, where they can meet with the company’s hiring specialists. 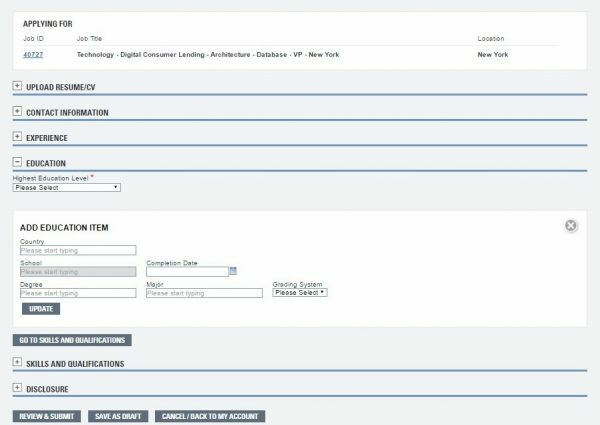 The main page of the Goldman Sachs application portal. Candidates can browse the available positions on the Goldman Sachs careers portal to find the best-suited positions for their professional and academic experience. They can select their career department and the location they would like to work in and the portal will present them with all the vacant positions that meet their criteria. 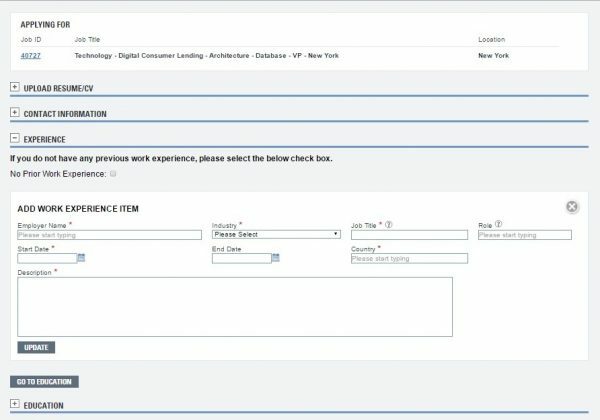 By clicking on the job titles, candidates can read the full descriptions of the Goldman Sachs careers. If they find a position that they want to apply for, they will have to click on the Apply Now button. They will be asked to create an account on the careers portal by registering their e-mail address. 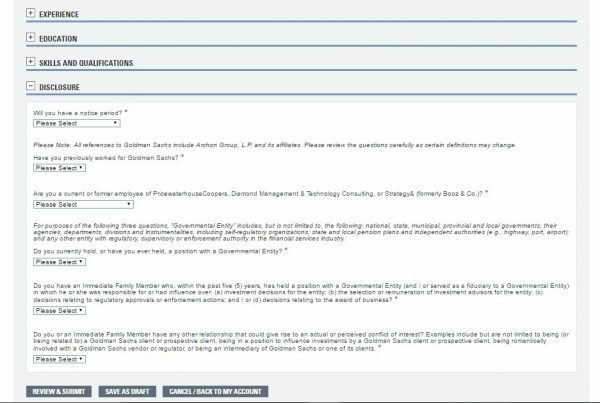 For this section of the Goldman Sachs application form, candidates are required to go through the company’s voluntary disclosure questionnaire. They will be asked about their race, gender, sexual orientation, transgender status, disability status, and their military status. Please note that it is mandatory that all candidates provide answers to the questions featured in this section. However, it is not mandatory that they disclose this type of information if they do not feel comfortable doing so. If they do not want to answer one or any of the questions, they can choose the “I do not wish to disclose” answers. For this section of the Goldman Sachs application form, candidates will be asked about their legal authorization to work in the United States. They will be asked to state which type of visa they have for the second questions. This is the data-fill feature of the Goldman Sachs application form. 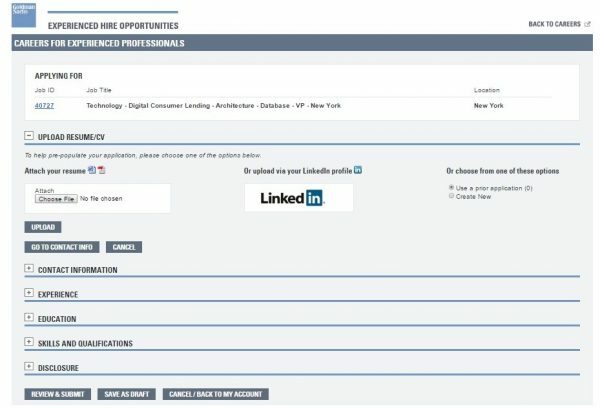 By providing their resumes or connecting to their LinkedIn profiles, candidates can have some parts of the form filled-out automatically by the portal. Please note that the resumes uploaded to this section will not remain attached to the candidate’s profile. Candidates can provide their resumes for this section to use the Goldman Sachs application portal’s data-fill tool. 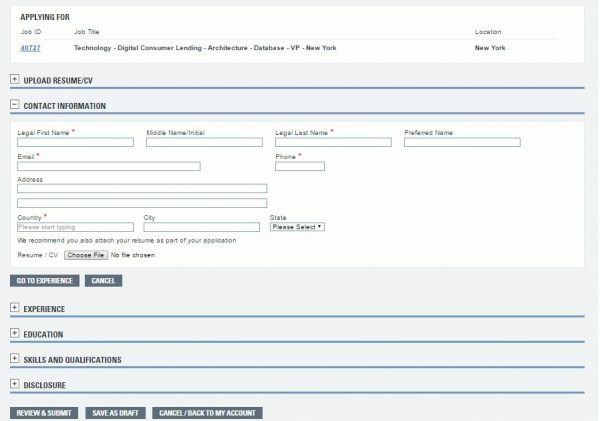 For this section of the Goldman Sachs application form, candidates are required to provide their complete contact details. At the end of this section, they can attach their resumes to the form. For this section of the Goldman Sachs application form, candidates are expected to provide their complete contact details. For this section of the Goldman Sachs application form, candidates must provide information about their previous employment. For each of the positions they include, they will have to mention the name of the employer, the industry it operates in, their job titles, as well as a description of their responsibilities as part of that career. Candidates can include information about their work experience for this section of the Goldman Sachs application. This section of the Goldman Sachs application form requires candidates to provide information about their academic background. They will be asked to include details about the main programs they have attended throughout their education. For this section of the Goldman Sachs application form, candidates are required to provide information about their academic background. For this section of the Goldman Sachs application form, candidates will be asked to include information about their main professional skills, language skills, as well as any licenses or certifications they may have. For this section of the Goldman Sachs application form, candidates are required to provide information about their language and professional skills. This section of the Goldman Sachs application form includes a short questionnaire centered on any previous employment that the candidates and/or their immediate relatives have had at the company. For this section of the Goldman Sachs application form, candidates are required to answer a few questions about any previous employment they may have had at the company. This is the final section of the Goldman Sachs application form where candidates can see their filled out profiles and correct any mistakes that they might have made. After they proofread their forms, they will be able to submit them to the company’s Human Resources department for assessment. Please note that they will be able to keep track of their application status on the Goldman Sachs careers portal afterward. In the following sections of out article, you will find more tips for applying at Goldman Sachs. Job seekers can find the complete list of vacant Goldman Sachs careers on the company’s employment portal. They will have to submit their online applications via the careers portal to be considered for their chosen positions. The Goldman Sachs internship program is one of the most competitive ones in the investment banking industry. Interns get to work with some of the most esteemed specialists in the field. They will get to learn practical skills that they can later apply in their careers. Goldman Sachs salaries for interns are negotiated during the interviews according to the academic profiles of the candidates. These may vary between $9.00/hour and as much as $33.00/hour according to the specific skills of the candidates. Job seekers interested in Goldman Sachs careers in management will find the updated list of opportunities for employment on the company’s careers portal. If they meet the job requirements, they can submit their online applications to be considered for their chosen positions. Goldman Sachs employees are offered a competitive set of benefits, which are meant to keep them safe both at work and outside it. According to their career level and the duration of their collaboration with the company, they can apply for various healthcare, insurance, financial, and paid time off benefits. The Goldman Sachs application form should take about 15-30 minutes to fill out, provided that candidates have an updated version of their resumes at hand. We strongly advise applicants to go through all the sections of the form, including those that are not labeled as mandatory. It is also very important that they attach their resumes, as this will offer the HR specialists detailed information about their professional and academic experience. They should make sure that all the information in their resumes is up to date and that the previous positions that recommend them for their chosen Goldman Sachs careers are described properly. Using the portal’s data-fill feature will save them quite a bit of time because it will populate some of the sections in the form (Contact Information, Work Experience, Education). If they choose to use it, however, they should review the information transferred by the form to make sure that there are no data inaccuracies. In the registration e-mail, candidates will be notified that they have 24 hours to submit their Goldman Sachs applications. As such, they should make sure their complete their forms and submit them to the Human Resources department within this time frame. The Goldman Sachs applications will be analyzed by the Human Resources department. The hiring specialist will choose the best-suited candidates for each of the vacant positions according to their professional and academic experience. These candidates will then be called in for the Goldman Sachs interview process. This may include up to four job meetings, depending on the career departments and positions chosen by the job seekers. They will be assessed by the Human Resources representatives, as well as the Goldman Sachs employment managers before they receive their final answers. Candidates preparing for the Goldman Sachs interview are advised to do their research about the company before they attend the job meeting. 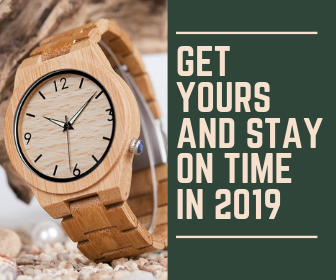 They can go to the company’s official website to find complete information about the company’s major achievements, as well as the main products they offer to customers. They should make sure their attire and appearance are in line with the occasion. Candidates applying for entry-level Goldman Sachs jobs should opt for business casual outfits. Those interviewing for high-level positions, however, should aim for formal outfits to comply with the required etiquette. Candidates should also take the time to go through the following sample questions to practice their interview answers. While they might have different questions at the actual job meeting, the practice should help them improve their performance. Please note that these are general questions. Candidates should expect to get employment specific questions as well during their Goldman Sachs interviews. Why have you chosen to apply for Goldman Sachs employment? What do you know about Goldman Sachs? What do you think makes you a good fit for this Goldman Sachs career? On a scale of 1 to 10, in which 1 is you are very smart and 10 is you work extremely hard, how would you rate the way you get work done? Could you please tell me about a time during your professional experience when something did not go as planned? What did you do to get your job done? What can you tell me about yourself that is not mentioned in your Goldman Sachs application?